Bhu Kradaeng Forest Park is partially located in Ban Phue Ampur (district), in the Udon Thani Province and extends to the Suwanna Khuha Ampur, in the Nong Bua Lum-Bhu Province. 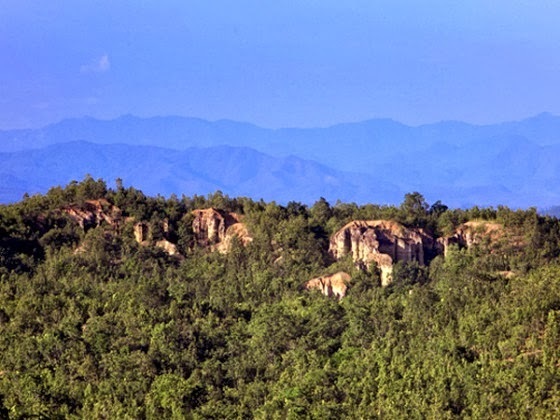 It actually consists of a number of parks that are adjacent to each other, namely Phu Pha Man National Park, Phu Kradueng National Park, Pha Nok Khao, Phu Kradeung Park and and Dong Lan Botanical Park. Bhu Kradaeng is a forest park of 17.87 square kilometers, and has been opened as a park since May 1996. 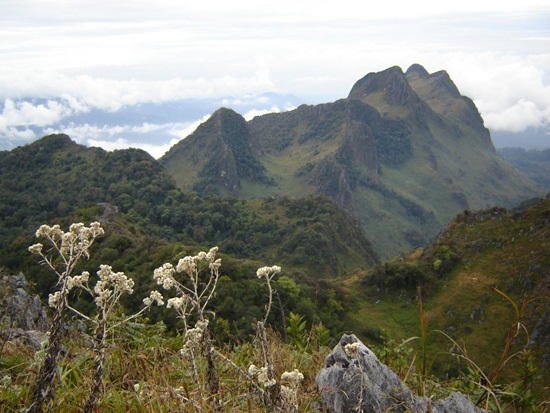 The Forest Park is a group of mountains on Bhu Parn Ranges but it is separated clearly from the ranges in the south. Both in the east and the west, this park is connected to the plain in all directions. 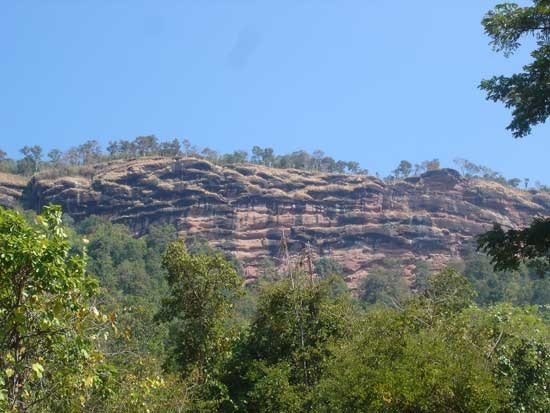 The Bhu Pha Daeng group is mountainous and consists of many big and small mountains such as Bhu Klum Kao, Bhu Mak Kliang, Bhu Pa Peung, Bhu Kloy, Bhu Na Pak, Bhu Kaya, Bhu Buk Tui, Bhu Hum Ma, and Bhu Mok Hed. The highest peak is Bhu Pa Daeng Cliff, which is about 300m to 400m above sea level. By difinition, these are not actually mountains, as a mountain is defined as having a minimum height of 500m, but they are certainly high enough to give a mountainous impression. The park features, in the main, two types of vegetation, namely dry evergreen forest and mixed deciduous forest. Wildlife such as Civet, Wild Pig, Porcupine,Pangolin, Hare, and snakes can be found here, as well as bird species such as Green Peafowl, Barbet, Coucal, Junglefowl and Woodpecker. This park is primarily for the nature enthusiast, but even just visiting for several hours, exploring small pockets of land, is a worthwhile adventure, as you have the opportunity to get away from all the roads, people and everything else that makes up modern day life in Thailand. You could quite easily spend weeks on end here, just wandering around, seeing everything on offer, or keeping still in wait for the wildlife to appear and be observed. 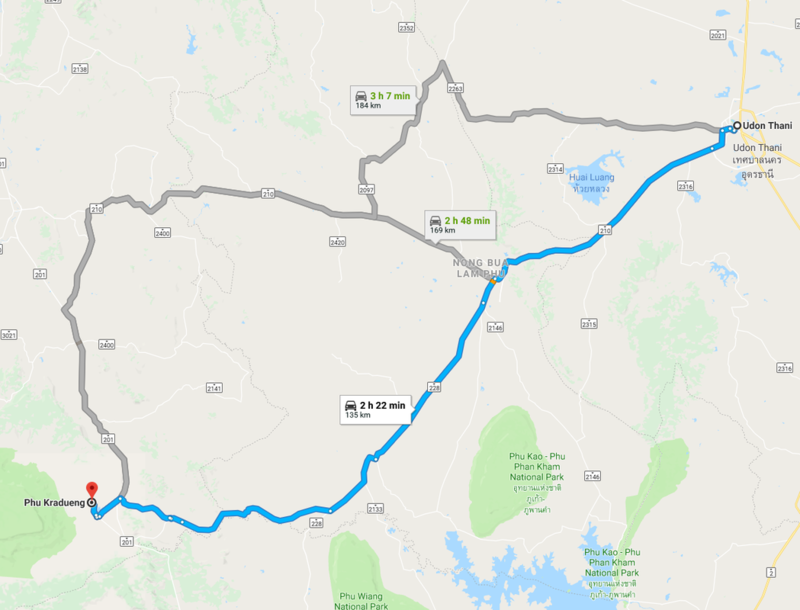 From Udon Thani, head for Nong Bua Lam Phu on route 210. Follow this road in to the town, where you then turn left on to route 228, heading south west. At Ban Non Ngam school, turn right on to a local rural road. This road will take you to the northern part of Phu Pha Man National Park.